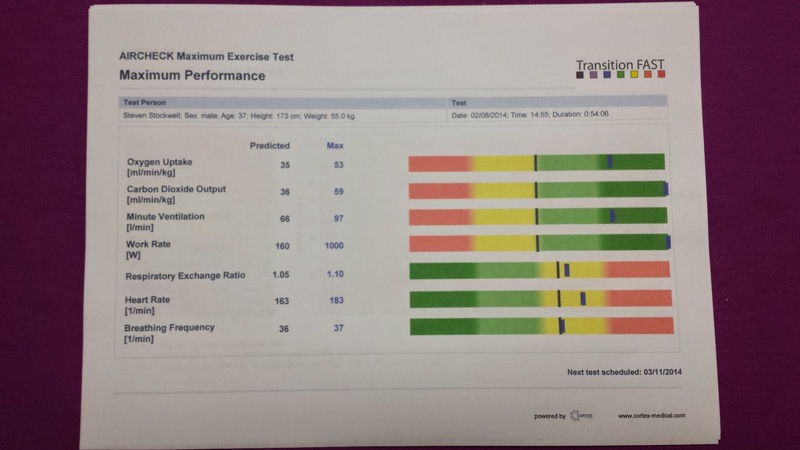 Through my running club, So Let's Go Running, the opportunity arose to have a session with a Kent based VO2 max tester Richard Dewis of transitionFAST. At first I was reluctant to go along - I wasn't quite sure what I'd do with the information once I had it, or if I needed it at all. But thanks to a bit of persuasion, for which I am very grateful, from Brian at my running club, I took one of the slots. 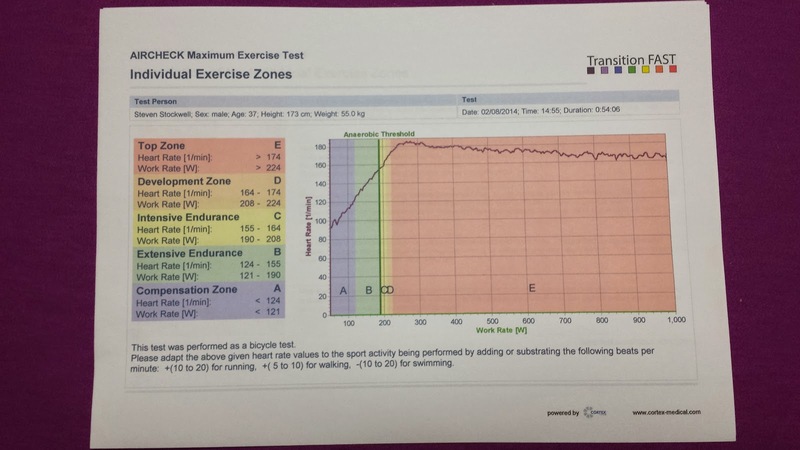 The test was conducted on a stationary bike. I had a heart rate monitor strapped to my chest and a face mask put over my mouth and nose to monitor my breathing etc. The test starts with 4 minutes of very low resistance as a warm up, and then the real test begins. The resistance is increased automatically by the bike as per the pre-set configurations. Minute after the minute, the resistance is increased. I was instructed to keep going until I felt as if I could not go on any longer. To cut a potentially very long story a little shorter, after 54 minutes on the bike, Richard stopped me because I had reached the maximum resistance (1000W) that the bike was capable of producing and the computer was no longer taking readings. I was apparently the first person to do this on his equipment. I was nowhere near ready to stop when he did so, and this was on the back of a hard 5k run just a few hours earlier. 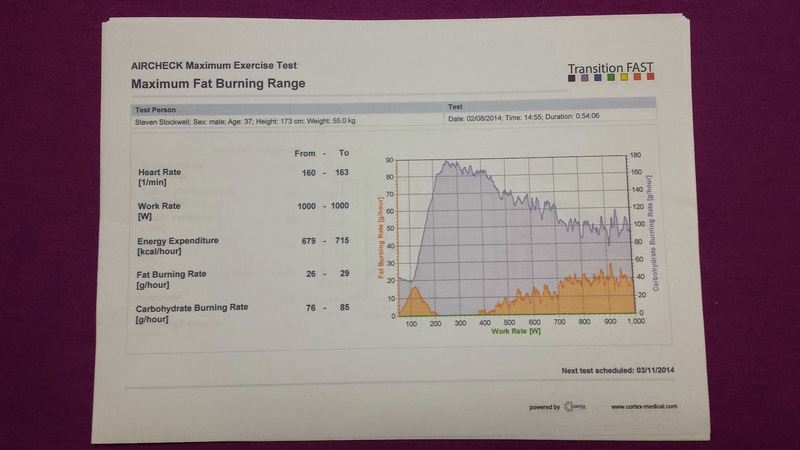 I might need to redo the test on a treadmill in order to get the intensity higher. Based on the session and results, Richard says that I am probably best suited to endurance races like marathons and ultramarathons. And although the exact split isn't known, it looks to be practically guaranteed that I have a greater percentage of slow-twitch muscle fibres. Richard also explained that when my heart reaches its maximum heart rate, the valves open a little wider to let it pump more blood with each heartbeat. I assume this is a good thing. The graph shows where where my body was pulling its energy from as the work rate was increased - blue is the amount of carbohydrate being used and the orange is fat. 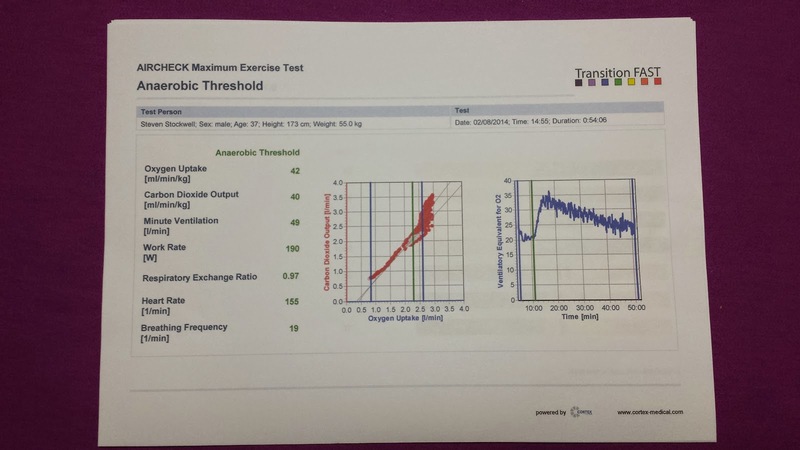 My anaerobic threshold (the point at which lactic acid starts to accumulate in the bloodstream) occurs at a heart rate of 155 bpm. This shows my heart rate and the different zones I was in during the test. On the left are training zones I would be in and the heart rate that would put me there. The VO2 Max reading is in this one, along with my maximum heart rate, which came out at 183. 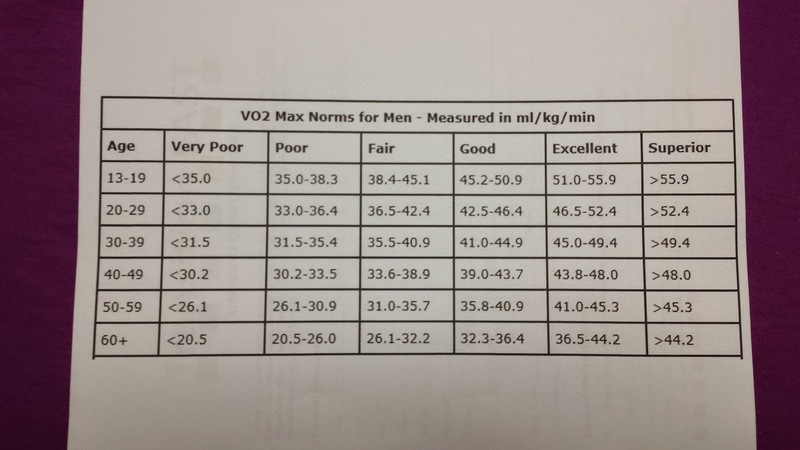 Based on my age (37) and my VO2 Max (53) I am in the 'superior' category. Can't really complain about this. 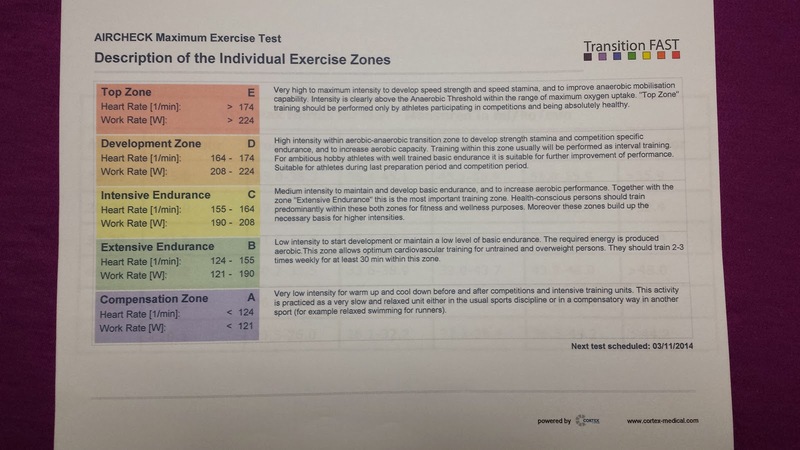 Some bespoke information on the training zones, along with the appropriate heart rate for me to reach to stimulate that particular area. Now I just have to work out where to go from here. Training by heart rate is something I'd like to try and I now have the proper information to do that effectively. There's also the question of whether I start looking towards some longer distance races (marathon and further) or whether I stay focused on the shorter ones (up to half-marathon). Lots of thinking to do, and I'm sure the answers will come to me eventually.